Good question, my dear reader. Good question. Let me tell you, I’ve learned a few things along the back roads and dark alleys of America. 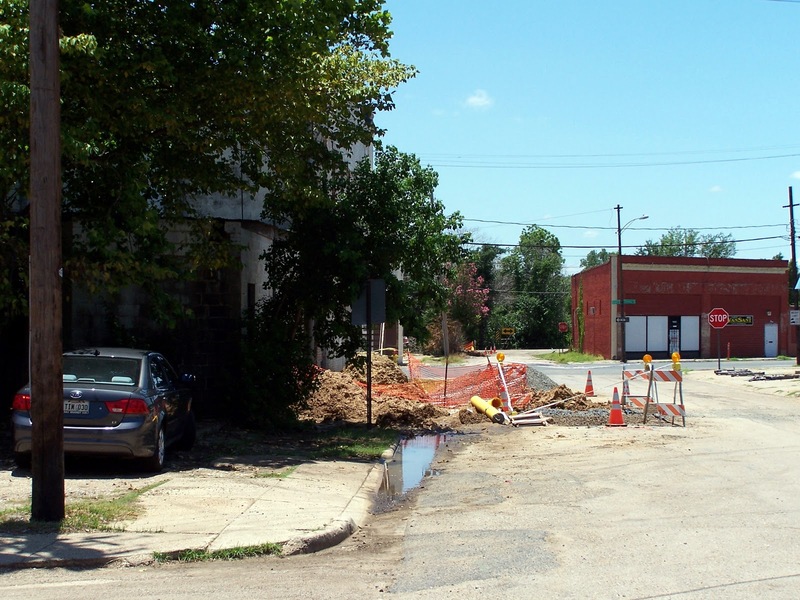 First, “progress,” “urban renewal,” “gentrification,” whatever you want to call it, is overrated. 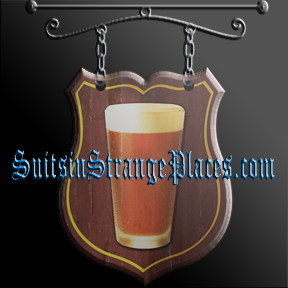 Second, if you find a crowded parking lot in a really, really bad part of town, you might have stumbled upon a cool place to eat and drink. That, or a meth lab. Could be either one. But, you know, broken bottles, pot holes and an element of danger always adds a bit of fun to this whole Suit in Strange Places gig. 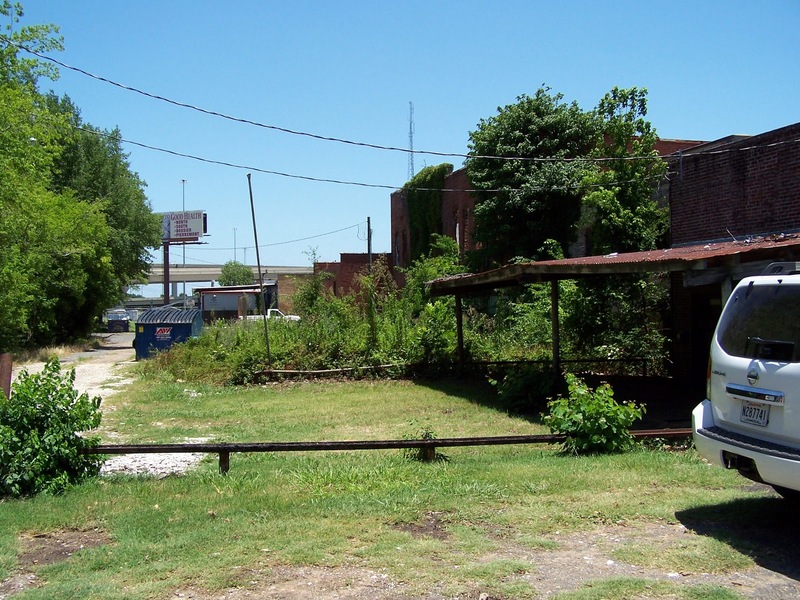 It’s like being in Detroit. Without actually having to BE in Detroit. 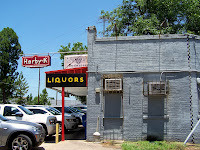 If you sit in the weed-filled, gravel parking lot between Herby K’s and the abandoned dilapidated brick building next door for a minute or two, you’ll notice that the folks who crowd into this place under the I-20 overpass at lunch time don’t come back out five minutes later. Not a meth lab. It’s safe to go in. 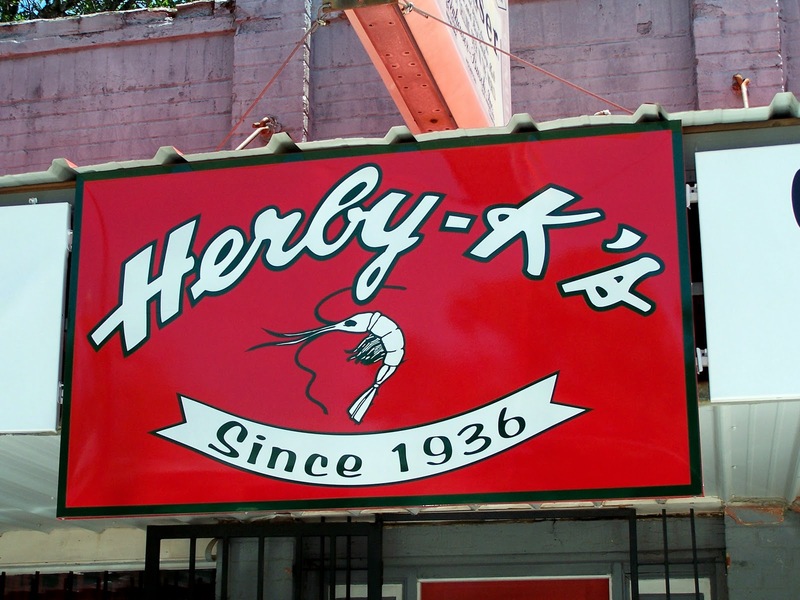 What Herby K’s has been serving here since 1936, in the part of town “progress” bypassed, is even more addictive. 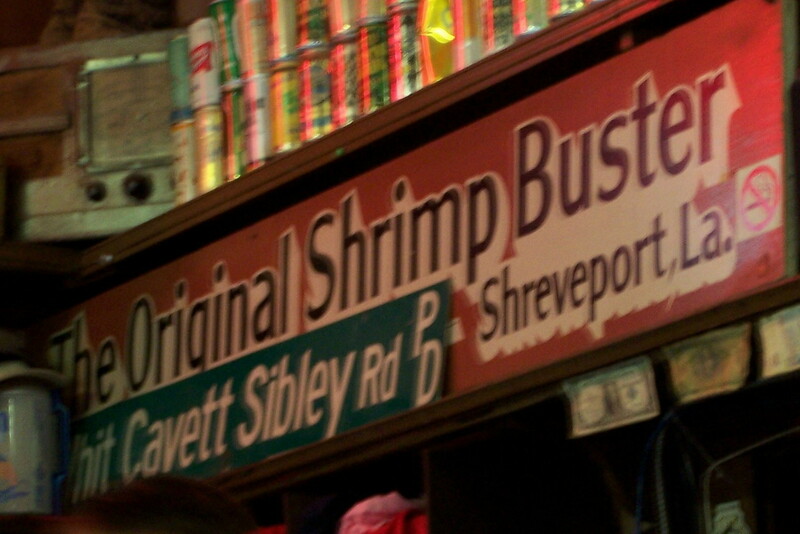 Their world famous “Shrimp Busters”. Four or five fresh-off-the-shrimp-boat butterflied shrimp that look like they’ve been run over by a steam roller served on buttered and toasted French bread with a wildly tasty red “shrimp buster” sauce on the side. Once flattened, the shrimp are as wide as the loaf of French bread and almost thin enough to see through. Then they are breaded and fried to perfection, creating an oddly perfect ratio of grease to seafood. Addictively crispy and delicious, they remind me of shrimp potato chips. Some regulars attempt to eat as served, all stacked on top of each other with French bread on the bottom as the base for an open face sandwich. 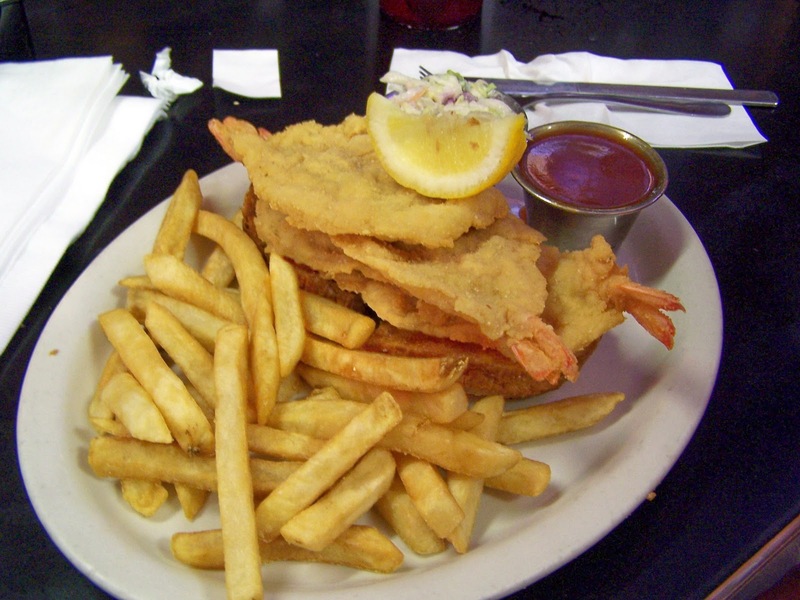 Most folks just eat the crispy shrimp one at a time, dipping them in the sauce before each bite. Oh, that sauce. I’m still dreaming about it. Sweet, but zesty, it pours thin like a hot sauce and saturates the fried breading of each shrimp. 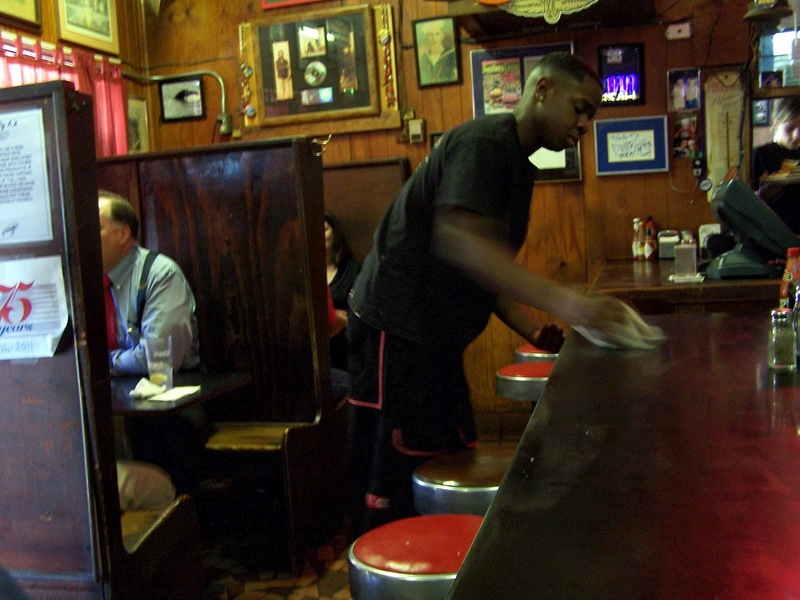 No wonder self-respecting Shreveporters have been venturing to this forgotten side of town for 75 years. But you know what? This isn’t my first rodeo. 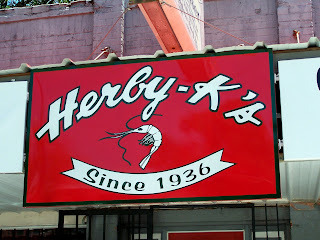 On this particular visit to Herby K’s, I had to try something different. An oyster loaf with sides of peppery cole slaw and perhaps the world’s most perfect onion rings. 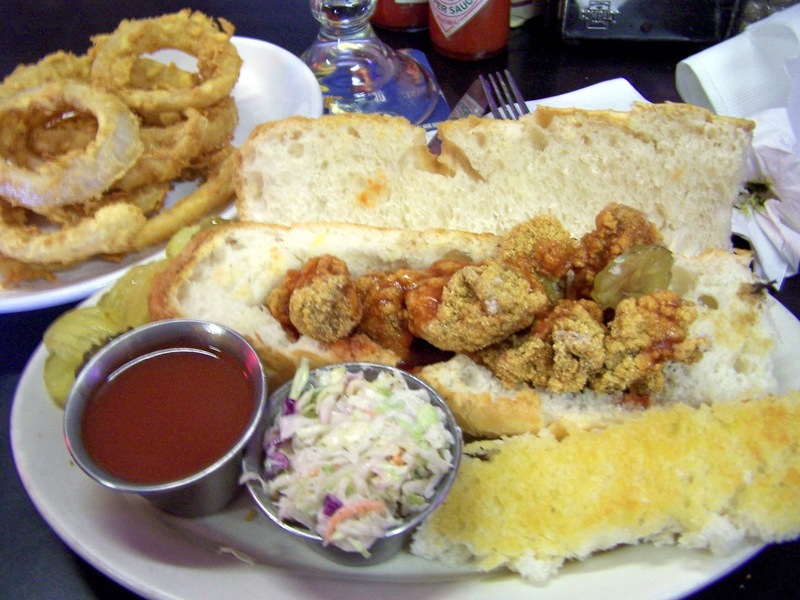 Oyster loafs are famous all over the great state of Louisiana. Herby K’s version starts with an entire loaf of freshly baked French bread. They split it length-wise, carve out the soft middle from the bottom half and fill it with fresh-from-the-fryer crispy fried oysters, a drizzle of that famous “shrimp buster” sauce and a few pickles. The soft bread, the crunch of the oysters and the flavor wallop of the sauce will leave you in state of Cajun nirvana. And the soft French bread remainder they carved out? What happens to that? Fed to the neighborhood stray dogs? They toast it up and butter it and serve on the side. 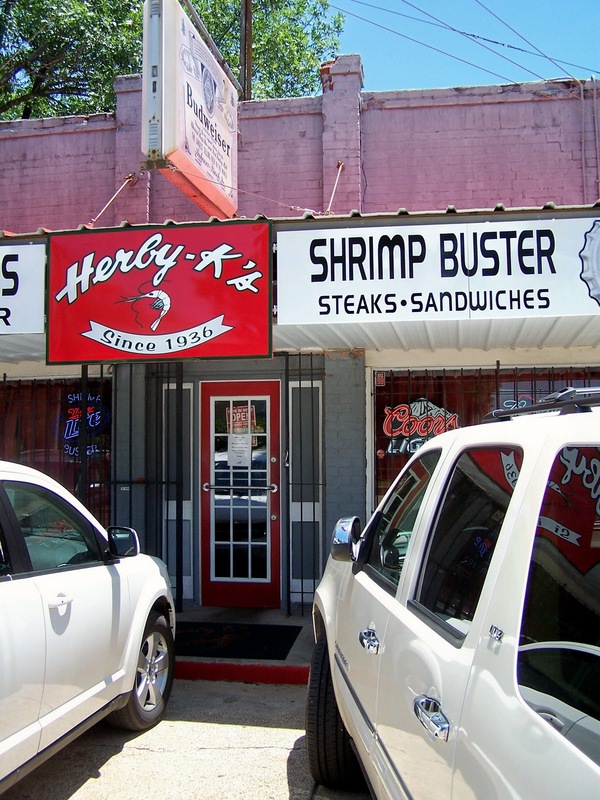 I also had to try Herby K’s appetizer of “marinated crab claws”, a popular starter in Shreveport. 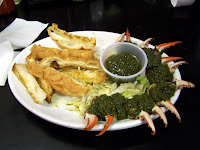 Each little blue crab claw was covered in a dark green garlicky pesto sauce with a side of buttered garlic French bread. Sure, the pesto overwhelms the delicate flavor of the crab a bit, but I can see why it is such a popular dish here in this part of the country. 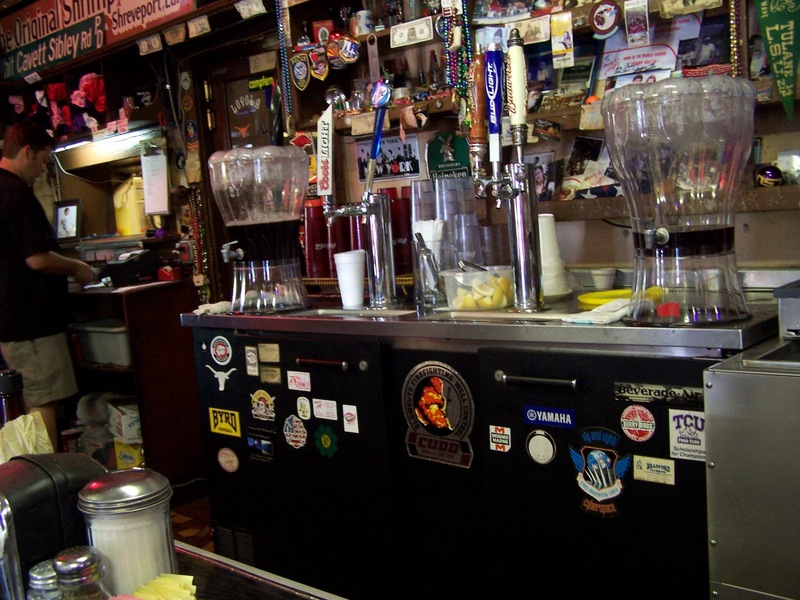 While no one ventures to Herby K’s just to drink, the bar offers up plenty of beer to wash down the good seafood. 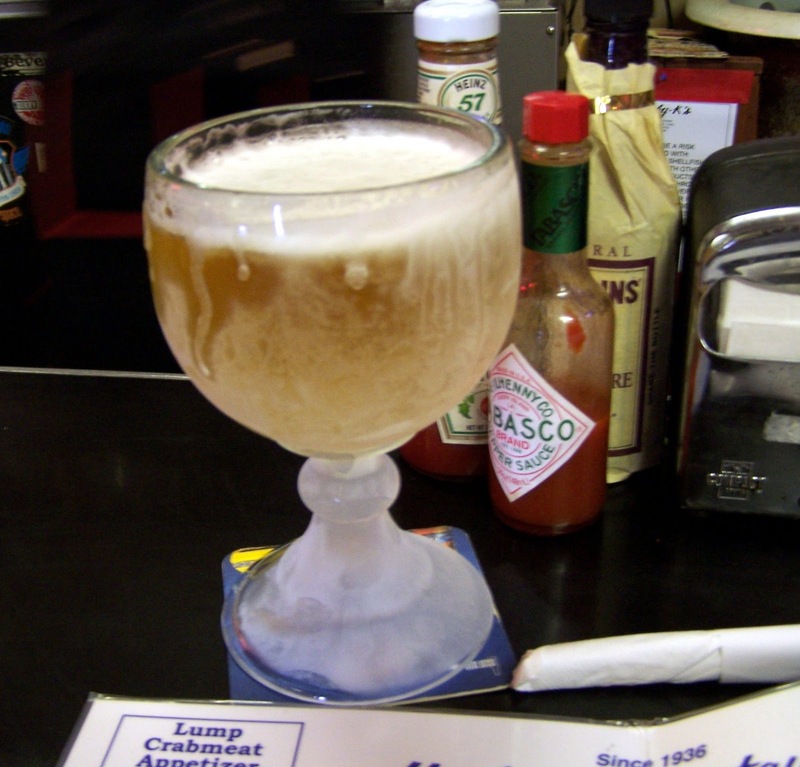 Ice covered fish bowls of draft beer are a perfect accompaniment to shrimp busters and oyster loafs. The enormous and heavy bowls of suds are impressive to look at, but my suspicions about the glass-to-beer ratio were confirmed when I ran out of beer before I ran out of lunch. Hey, it’s 95 degrees out and that shrimp buster sauce has a kick to it. I was thirsty, okay? So I ventured onto the bottled beer selection and against my better judgment ordered up the summer seasonal from Abita -- Louisiana’s favorite microbrewery. 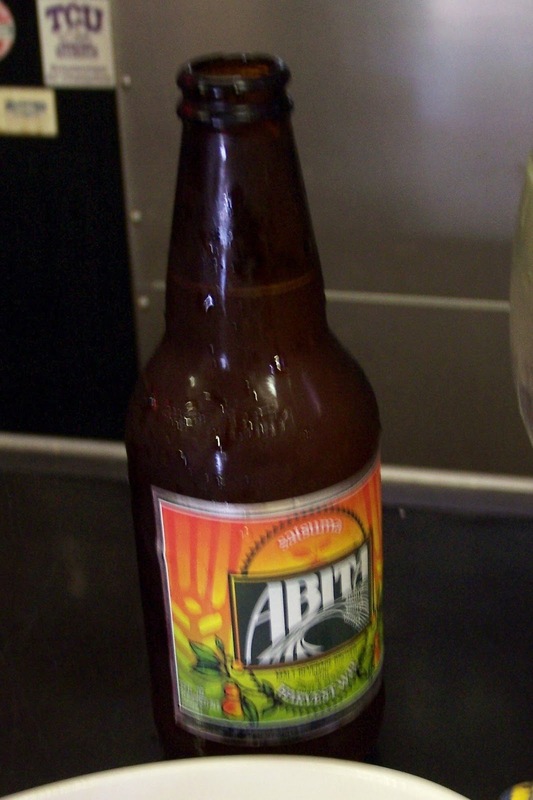 Abita Satsuma Harvest Wit is a wheat beer seasoned with real Louisiana-grown Satsuma oranges. Sweet and sour with a funky aftertaste, I’d toss it in a pile with all those other fruit-laden wheat beers. The only purpose I can see for these kinds of beer is to store a spare sixer in the back of the fridge for those lame chicks who come over and “don’t like beer.” They’ll love it. Meanwhile, give me a Turbodog to expunge that nasty aftertaste. 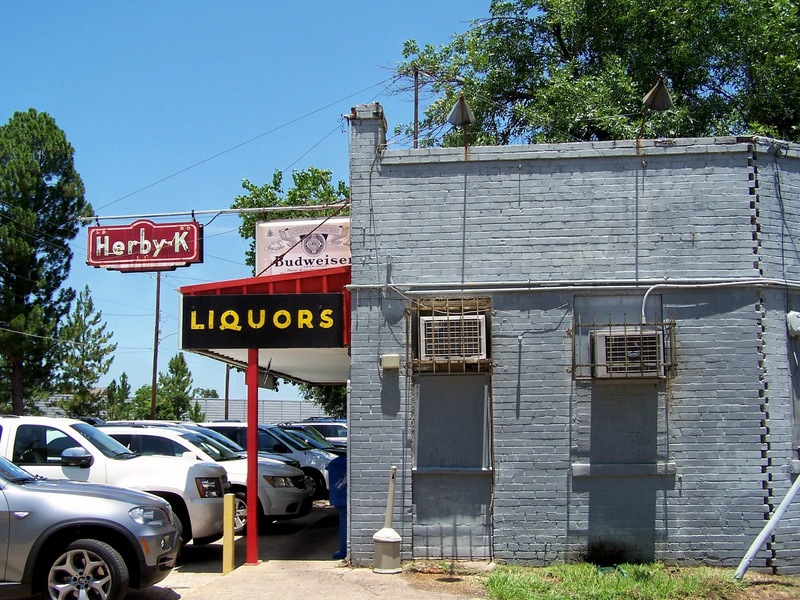 Alas, Herby K doesn’t have Turbodog. Like I said, eating takes precedence over drinking at Herby K’s. 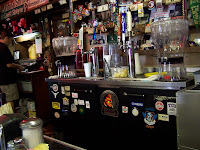 Next time I’ll just order up another frosty fish bowl filled with Miller Lite. Shrimp busters. Oyster loafs. And ice-encrusted bowls of beer. Yeah. I’ll dodge the pot holes, broken glass and stray dogs for THAT any time of day.